The Cranberry Iron Mine is located on an immense subterranean stretch of titaniferous magnetite (titanium, iron oxide) centered around Cranberry in Avery County. Said to have been used by Indians before their contact with whites, it came to be worked mainly from surface ore by 1829 and was opened to systematic production around 1880. In 1882 a railroad facilitated movement of the ore to the furnace. The ore, low in silica and phosphorus, was characterized as the largest deposit of Bessemer ore in the South. By 1974 it was the only active iron mine left in North Carolina. W. F. Wilson and others, North Carolina Geology and Mineral Resources: A Foundation for Progress, North Carolina Geological Survey Educational Series no. 4 (1976). 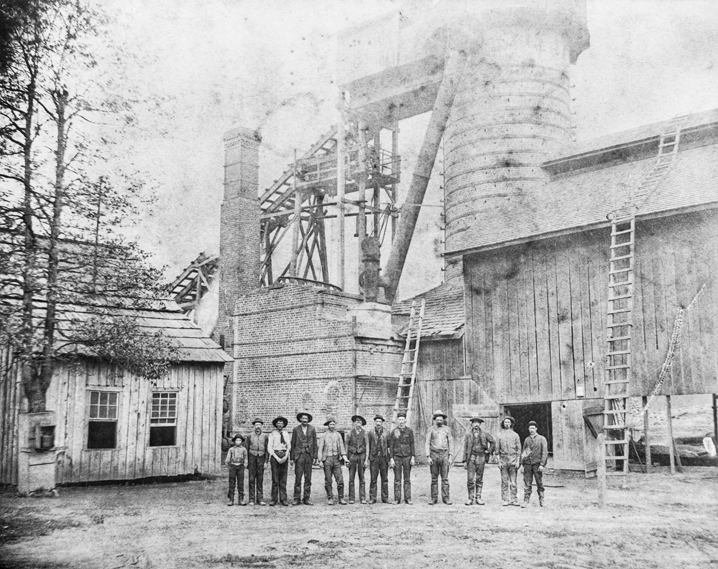 Employees stand in front of the furnace of the Cranberry Iron Mine, ca. 1895. North Carolina Collection, University of North Carolina at Chapel Hill Library. George Lobdell of Wilmington Delaware who had Lobdell Car wheel works one of the largest Train car wheel manf.Had a operation on the Cape fear river near the Harnett/ Lee county line.From stories I heard Union soliders camping in the area found the ore on the surface plus there were iron operation in the area during the war.Lobdell found about this and took samples and found it to be done of the best ore he had found.He later set up smelters in the area and it became known locally as little Pittsburg. He planned a big operation including improve canal system up to the river to othe railroad.But found the vein of ore ran out at the Jonesboro Fault line.Geologist searched for it but could ever find it.The iron boom on the Cape Fear river was over.The site fell into ruins the during WWll the scrap iron was collected for the war.Nothing remains but a couple of rock walls where the furnaces set.The site is only acessable by foot and a several mile hike .The area is locally known a Buckhorn community on the river. Where is the concrete teepee in Mortimer, NC? Thanks for visiting NCpedia and taking time to share this question. That's a great question! Unfortunately, after some searching, I'm unable to find anything about a concrete teepee. If you happen to come across something, please post back in NCpedia and share it with us! I understand that C. M.
I understand that C. M. McClung made a shotgun named "Cranberry" in the early 1900's from iron mined from the Cranberry mine. Do you have any information about when the guns were made? I have a 12 GA shotgun with "Cranberry" on it and a serial number 246208. The barrel is 34 inches long. Anything you can tell me will be helpful. Thanks. I am connecting you by email with Reference Services at the N.C. Government & Heritage Library. A reference librarian will contact you shortly to help you with this question. Does anyone know where the Native Americans of N.C. dug for minerals for trade with other Indian tribes? That's a great question! I'm including a few additional resources from NCpedia that give some information. Mining, Part I: Before European settlement -- there has been evidence of mining by the region's Native Americans at Baird Mine in Macon County and Sink Hole Mine in Mitchell County. Mining, Part 2: There is evidence that copper was mined in a number of counties by National Americans prior to exploitation by explorers following the Roanoke Island settlement in 1585. If you would like help locating additional resources, reference librarians here at the Government & Heritage Library may be able to help. You can find their contact information on our website at http://statelibrary.ncdcr.gov/contact.html and they may be contacted by both telephone and email. The article characterizes this mine as the only one active by 1974 in NC. This is misleading and untrue. The mine shut down in 1929. Despite a short-lived pilot project to process ore during WW II, the mine would be more accurately characterized as having been inactive since 1929. My grandfather Bob Greer was the supervisor and foreman at Cranberry Mine during the 70s.